Thanksgiving Cider is a wonderfully simple cocktail that blends apple cider with a vodka flavored by pumpkin and spice. It’s a warming drink, despite the ice, perfect for taking off a fall chill. This drink tastes like fall in a glass, and that’s the whole point of it. It captures those autumn flavors perfectly, all in one sweet little drink. It features Pinnacle Pumpkin Pie Vodka with apple cider and club soda. The vodka tastes like pumpkin with notes of vanilla, nutmeg and cinnamon. The resulting flavor is something like a spiced apple pie, but with that lingering mellow note that’s hard to identify. That’s the pumpkin. The sweetness of the drink is cut by the spice and tartness, making it an enjoyable cocktail for relaxing. The flavor is actually complex, but somehow it’s also easygoing. The pumpkin pie vodka takes all the sharp edges off the apple cider. And the apple cider adds a fresh semi-tart counterbalance to the pumpkin. This drink works very well with Thanksgiving foods. Turkey and dressing, sweet potatoes, etc. It’s perfect for serving after Thanksgiving dinner. A drink like this is ideal for sipping while you sit around talking. It has a soothing quality that makes good conversation just seem to flow. It’s also nice as a mild dessert drink for anyone who is watching sugar or calories and doesn’t want a big ol’ slice of pumpkin pie. This drink does still have some sugar and calories, but not as much as the pie. And yes, you can absolutely make a pitcher full of this drink in advance. Just put all the ingredients together and leave it sitting in the refrigerator. That makes it perfect for a get-together like Thanksgiving. It’s easy to serve refills and top-ups this way, and you can even let guests serve themselves. 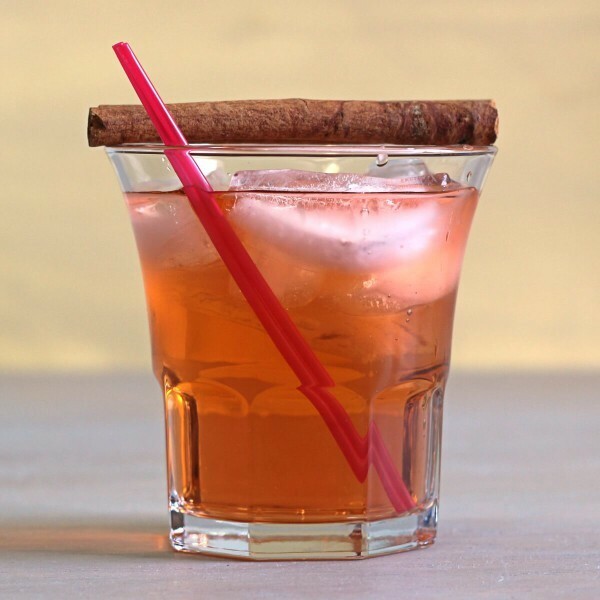 You can garnish this drink with a simple lemon wedge, but I prefer a cinnamon stick. 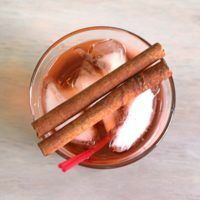 It just looks more festive and if you linger over the drink, it will actually impart some cinnamon flavor. Another great option for garnish would be a slice of apple. That keeps the fall theme going, signals one of the drink’s ingredients, and has the advantage of being edible. You may want to check out our 15 Delicious Thanksgiving Cocktails. It’s perfect if you’re looking for several fall-themed drinks to serve guests. Thanksgiving Cider is a very simple but very delicious cocktail. 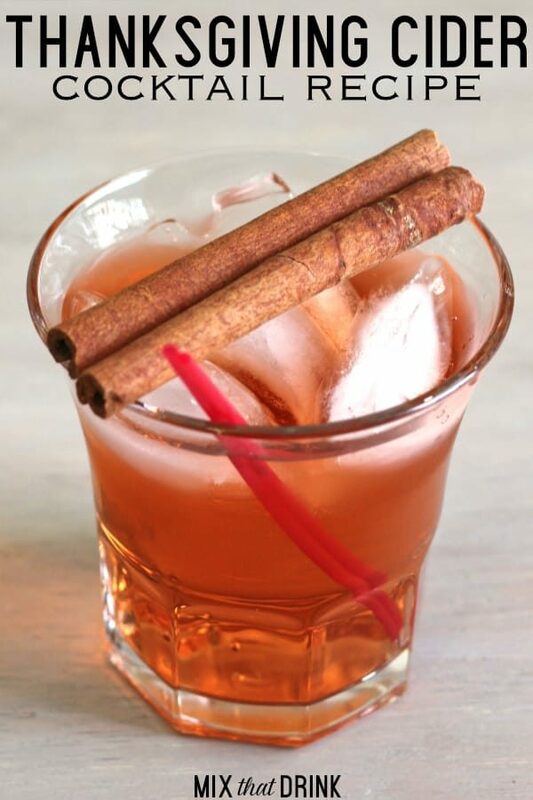 It features pumpkin pie vodka and apple cider, which gives it a wonderful fall flavor. Fill a highball glass with ice and build the ingredients in order. Garnish with a lemon wedge or cinnamon stick.